After each course Tutors are asked what they thought of it. Did you enjoy 121digital? : 98% said "Yes". ​Why did you enjoy it? : "It was fun", "It was enjoyable", "It was the most useful thing we did in transition year", "It was brilliant", "It made me proud of myself", "I learned a lot". Rate 121digital in relation to the other modules you have done in transition year: 25% gave 10/10 : 55% gave 9/10 or 8/10 : 5% gave the lowest rating which was 6/10. Would you be a Tutor again if asked? : 95% said "Yes". Have you recommended 121digital to other students in your school? : 90% said "Yes". How did you benefit from being a Tutor on 121digital? 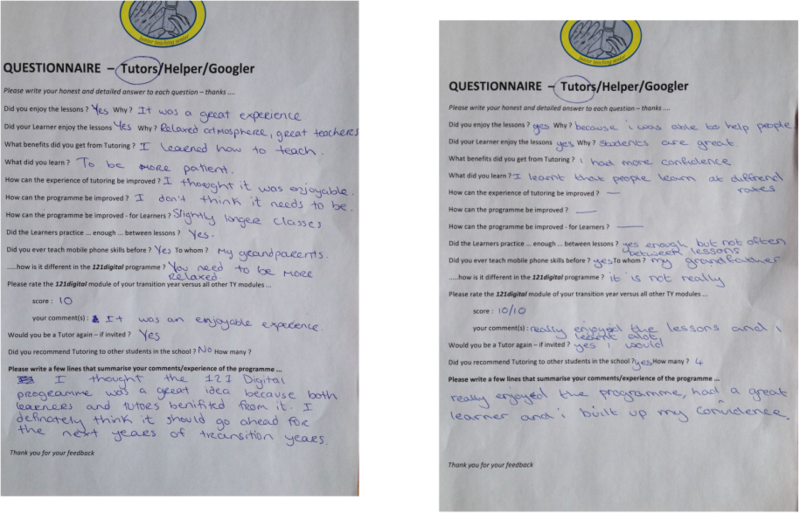 : "I helped people", "It made me feel good", "I realised that I have valuable digital skills", "I enjoyed teaching", "I liked to hear the Learners' stories", "I saw what its like to teach (just one person at a time) - now, I understand my teachers better." What did you learn? : "I discovered how adults learn", "I learned about senior citizens", "I found out that older people are really interesting", "I learned more about phones/laptops/tablets myself, by teaching". How can the experience of Tutoring be improved? : 85% said "It can't", 10% said "Longer (or more) lessons", 5% said "Shorter lessons". How can the programme be improved? : 75% said "No improvement needed", 25% had helpful suggestions which are being discussed, some of which have already been implemented. Tutors are asked to reply anonymously with their brutally honest feedback.